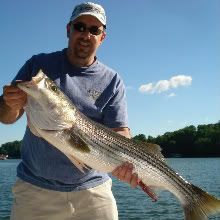 STRIPER SOUP :: View topic - Take a Fireman fishing. Posted: Wed Nov 17, 2010 5:59 pm Post subject: Take a Fireman fishing. Last year Jeff Blair and myself took out 8 of Habershams fireman as a gift giving away at the Christmas party. The guys had a blast and can't wait to see if they get drawn this year. Its is all they are talking about. If any of you Lanier guys would like to take out a group just let me know and we can draw some more names at the party. It would probaly be better to take them out on Sat or Sun. We will all fish the same day so they can trash talk each other. Mikemad has already offered his barge. Thanks alot Mike. We will talk about dates after we see how many volunteers we get. THANKS to all that will pitch in. I'm in Jeff! Can't think of anything I'd rather do more that give a little something back to these guys. Thanks Bryan, I know what it means to the guys. You will enjoy the trip. If it gets down to the grind, I can take a couple in the G3 if the other boats get crowded. The guys might just like the 65HP fire hose!!! Thanks Skiff it will fun. I know they would like the 65 hp hose. Whatever you need from me - I may be out of town right around Christmas but if I'm in town, I'll be glad to help. Posted: Thu Nov 18, 2010 1:59 pm Post subject: Looking forward to it! If you'd have me, I'd be glad to help you guys out. Just lemme know. Count me in my brother would love too!! !We need to get out there,hope all is well, talk with you soon. The Two dates I am looking at are Dec. 18 or Jan. 8 Which date is better for ya'll that are going to help. I gonna try to put two per boat that way it is less crowded. We will be drawing for names on Dec 12. Same here, either one should be just fine. We will make it Jan. 8 2011. Please PM me if you are wanting to take a crew out so I can draw the correct number of names out of the hat at our Christmas party. If you have any other questions please call me at 706-499-4478. Thanks again guys we will have a blast. I am sure most of these guys and gals have never striper fished before. Please leave me a contact number so I can pass along details. The party is this Sunday and I will draw 16 names. Please PM me your cell number if you are goingto help so I can contact you with further info. I am going to try to make a trip to get a load of trout to share with all that help. Again thanks to all that are helping. My Cell number is 706-499-4478. This is an awesome way to give away some of your blessings! Jeff, I'll PM you my cell number too, but it is 678-480-5720. I have the names of the guys and gal that are going and I am going to draw names for which boat they are going to be on. The Boats We will be using this year will be J. Blair, M. Mad, C. Payne, B. Bruek, J, Cocking, T. Farmer, and myself. Larry at Oakwood Bait and Tackle will sell us bait at his cost on that morning. For the other volunteers please come out and meet the guys and and help us put them fish by prefishing and scouting. At this time we will be putting in at Little River boat ramp and we will leave at 7:30 am. We will will fish all day. Thanks so much for your time. This was the biggest thing at the Christmas party. Everybody was so excited. If you have any questions please call me. Really looking forward to this Jeff. Thanks for the invite. Ok guys, don't forget about us tomorrow! This is going to be a Soup VIP fishing trip! Many of us have been pre-fishing for the event, so as long as the weather cooperates, it should be a great day! I spent 99% of the day scouting/graphing areas WITHOUT a rod in the water. 40 miles on the G3 today, and that's just MY boat! We're also going to have some other Soupers that are going to be tipping us off as well...that shows alot right there! Oh, and I can't wait for the Firefighters to start the trash-talking. Anyway, I'm putting it out there that it is going to be a GREAT day! Hope to take plenty of pics for the awesome report, too! High of 19 and 37 mph winds forecasted for tomorrow, or maybe it's the other way around....pretty nasty either way. Hope you guys stay warm and represent the Soup! Good luck. We better get a case of Soup cans ready to put on the shelves - good luck putting those firefighters on fish! Sorry guys, but tomorrow's forecast has been changed. Winds 5-10 out of the west. Hi will be 40-45 degrees and sunny. Oh, and they will be generating! Anything is possible! It's happened before!!!!!!!! After fishing today for a few hours it appears that there won't be much bait needed but that could change of course. U-rigs were the ticket today. Fighting fire in those conditions happens all the time so fishing in them should be a breeze. Thanks again to the soup troup for doing such a kind thing. Lets go out and have a blast and catch fish too. Good luck guys, your doing a great thing. From the sounds of the wind outside now you likely will have to use the big motor tomorrow. I really hope ya'll have fun and catch some fish tomorrow. Unless the phone message for water release is wrong they will not be generating tomorrow (which would be normal for a Saturday). Working on the report right now!!!!!!!!!! !